Volunteer project: There will be a variety of tasks in this project. Some days we will focus on renovation, painting, cleaning and fixing things around the volunteer house. Through the years, volunteers have been making beautiful drawings and paintings on the walls of the house. We will continue with that art work and we'll also make some sculptures. Other days, we will clean the coastline in the north near to the Arctic circle. Raufarhofn is a magical place, full of energy and amazing landscapes. This is the right place to enjoy your free time taking photos and having walks along the coastline. Local people from the village are very interested to get to know you and to take part in some of our cultural dinners or workshops. This project gives you the opportunity to spend an amazing time in Iceland with other international volunteers and to have an incredible experience where participants share their knowledge with each other while they are exploring creativity, environmental issues and intercultural learning. Leisure time: Reasonably-priced weekend excursions can be organised to some of the most popular, beautiful areas and natural wonders that Iceland has to offer. The area in the North is also good for hiking. There are also a few other leisure time options in Raufarhofn. You can walk (about 18 km there and back) to the lighthouse, which is the most North Eastern point of Iceland. The line of the Arctic Circle frames that area of Iceland closing the water of the Atlantic Ocean and opening the gates to the Greenlandic Sea. Another positive thing about Raufarhofn, especially if you like birds, is that the village becomes a migrant birds nesting area giving so much life to the place. Location: The village of Raufarhöfn is the community that lies farthest north in Iceland. It is located in the eastern part of Melrakkasletta close to the Arctic Circle. The population of Raufarhöfn is about 200 and most of the people there earn their living from fishing and fish processing. The harbor is very beautiful and partly shaped by nature itself. A wide and untouched open area surrounds the village with a lot of birds and varied vegetation. In summer, one will observe wild migratory birds within the village being a part of the village life with the villagers most often waking up in the morning to the songs of birds. The coastline with its inlets and creeks is filled with driftwood and reaches out into the Arctic Sea. Away and on the surface of the sea, various sea-birds will be spotted and an occasional seal. On the beach, waders strut, and inland on the grassy moorlands, there are dozens of lakes filled with trout. In the vicinity, many species of ducks, waders and species that favor heaths and moorlands may be observed. 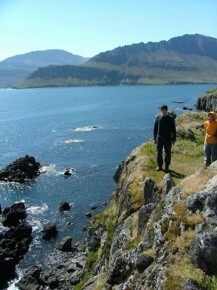 The volunteers will travel together from Reykjavik to Raufarhöfn and back. On the way to the project, we will drive through the south to the east of the island. After the project, we will drive through the north and west to Reykjavik (if road conditions are favourable). This trip includes several stops where you will discover unique Icelandic sights, such as glacial lagoons, waterfalls, volcanic and geothermal areas, glaciers, lava fields, hot-springs, rhyolite mountain ranges, steam-vents or even icebergs. The fee includes the trip from Reykjavik to the project site and back which is almost 1,600 km in total and takes 2 or even 3 full days (on the first and the last day of the project).